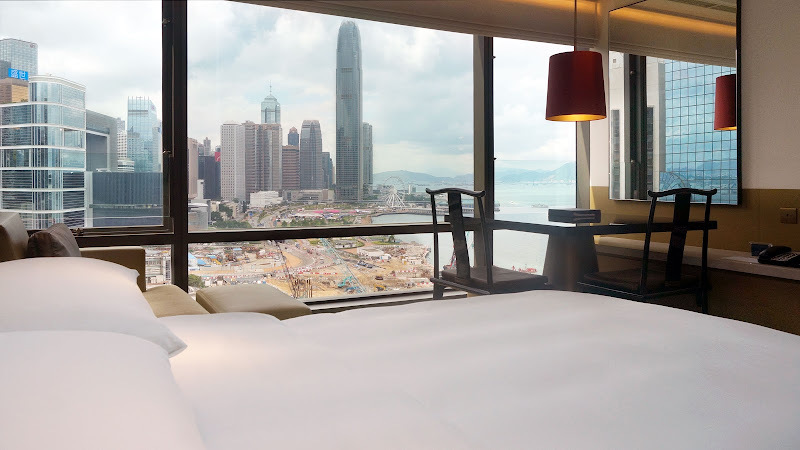 Grand Hyatt Hong Kong welcomes guests to Hong Kong with breathtaking views of Victoria Harbour and the surrounding cityscape of the Central district. The 545-room Grand Hyatt Hong Kong hotel features 10 restaurants and bars, a spa, and a 50-meter heated outdoor pool. The recent $90 million U.S. dollar renovation completed in 2016 has refreshed the rooms and suites with all-new bathrooms, furnishings, and the latest hotel-room technologies. Located only a few minutes from the Central, Wanchai and Causeway Bay business / shopping districts via “MTR” the Mass Transit Railway. 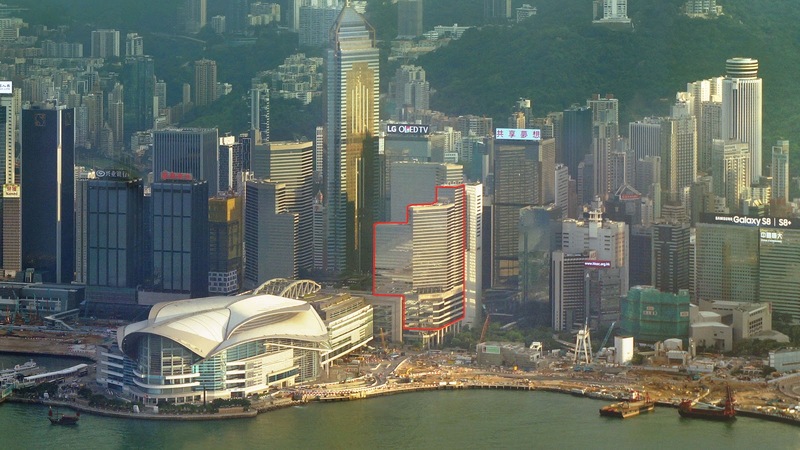 The hotel is also within walking distance via covered and elevated walkways from the Star Ferry Pier to Tsim Sha Tsui. It’s possible to walk (2.0 km) all the way to Causeway Bay district via the pathways integrated into the buildings, but that’s if you’re willing to spend 25-30 minutes. The best way would be to walk towards the Wanchai station via the elevated walkways and then exit on Hennessey Road along which you’ll find numerous eateries to dine such as; the Honolulu Coffee Shop (popular among locals) good for breakfast and snacks; the Michelin starred Kam’s Roast Goose famed for their roasted meats; and Dim Dim Sum Wan Chai on Tin Lok Lane. The elegant lobby has been welcoming guests since 1989. 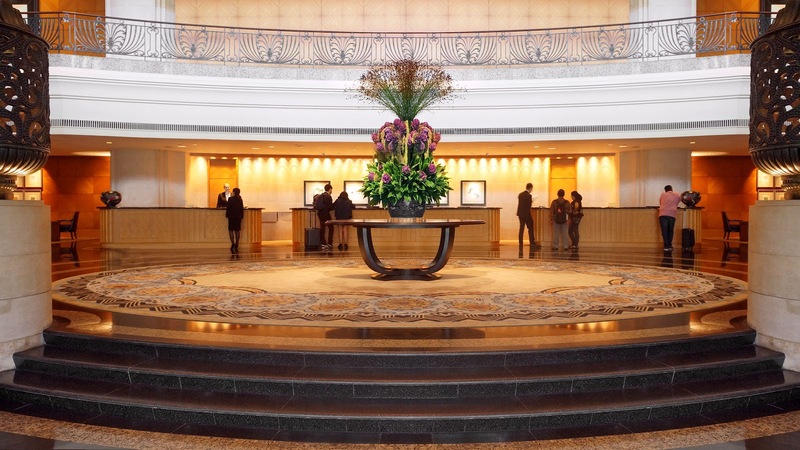 A pair of grandiose staircases with a relaxing water feature flanks the lobby on each side. 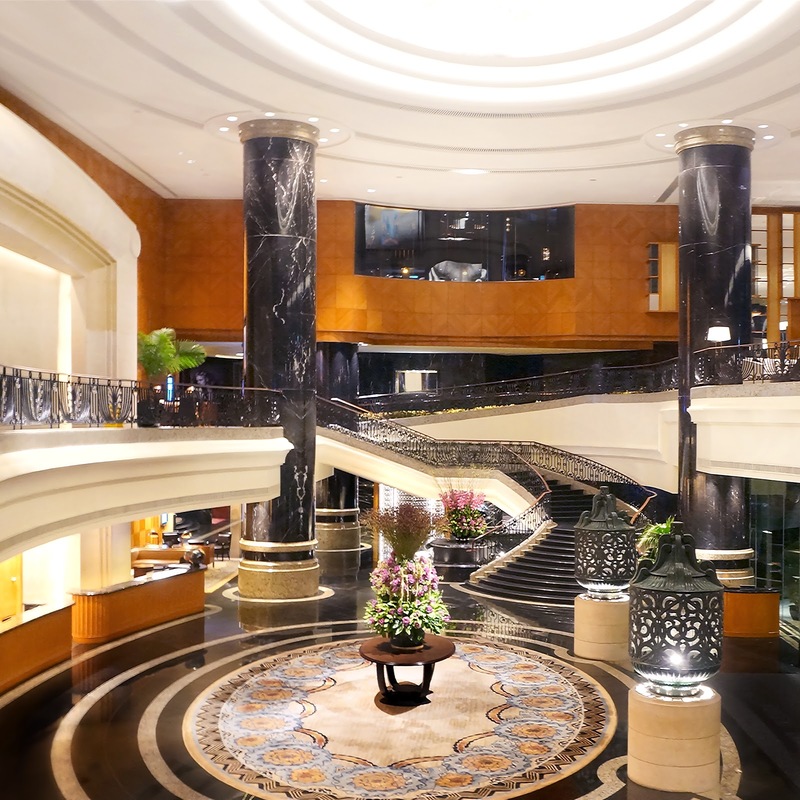 On the left side are the elevators to the rooms and the Grand Café (all-day dining and buffet restaurant); on the right side you have the foyer leading towards the meeting facilities (Grand Ballroom) and the entrance of the Grand Hyatt Steakhouse. The newly refurbished rooms and suites took almost 4 years to fully complete. The lobby hasn’t received a refresh, but its timeless design doesn’t call for an overhaul. 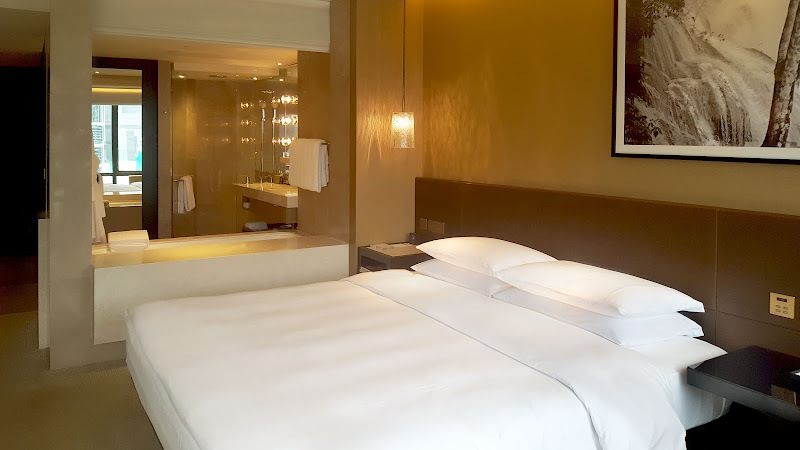 Indulge in an intimate, comfortable and functional 40 square metre room overlooking the Victoria Harbour. Each room is fitted with bedside controls to lower or raise the window shade / black-out curtain; dim or brighten lights; and switch door indicators (DND and make-up room). A spacious 2-seater dining table by the window also serves as the work desk. Also by the window is a plush lounge chair and ottoman perfect for an afternoon read or a laid back work session. Interestingly enough the air-conditioning vents are located by the windows preventing outdoor temperature from entering the room, so staying by the window remains cool. The bed has a comfy balance of softness and support, it’s lined with silky smooth linens for that cool and cozy feel. The redesign of the room opens up the bathroom to allow for views of the harbour or city while soaking in the tub. A black-out curtain can be lowered with a touch of a button for privacy or if you don’t want the cool air interfering your warm bath. Complimentary Handy Phone with unlimited 4G data (built-in hotspot mode) and free local and international* calls. 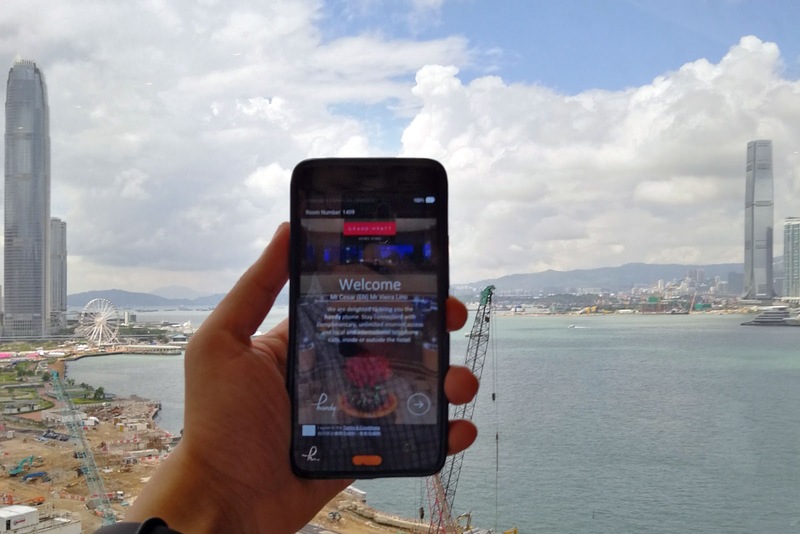 Beyond the room amenities: Take the Handy Phone with you around Hong Kong. Enjoy the unlimited 4G data on the phone or share it with multiple devices via the Wi-Fi hotspot feature. Unlimited local calls and international calls to the United States, United Kingdom, France, Germany, Australia, Singapore, China, India, Japan and South Korea.